So I've been playing around with applique again this week. Pre-laser-cut fusible applique to be exact! Oh sounds dangerous. 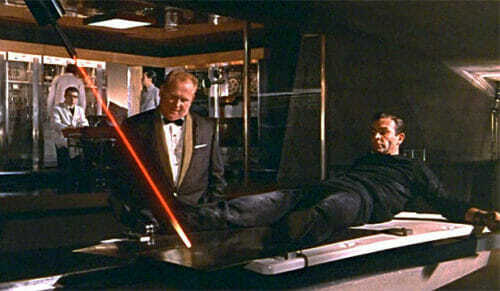 I must be showing my age, but every time I hear the word LASER I think of this! Laser-cut fusible applique is not quite as exciting, but still fun. 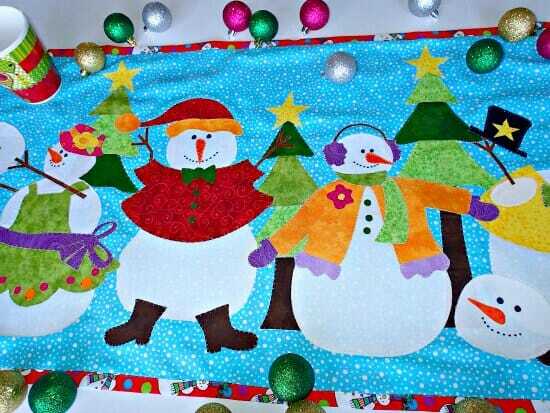 I took the Fun with Fusible Applique Class from Craftsy earlier this year and one of the projects was the Snowmen pattern. 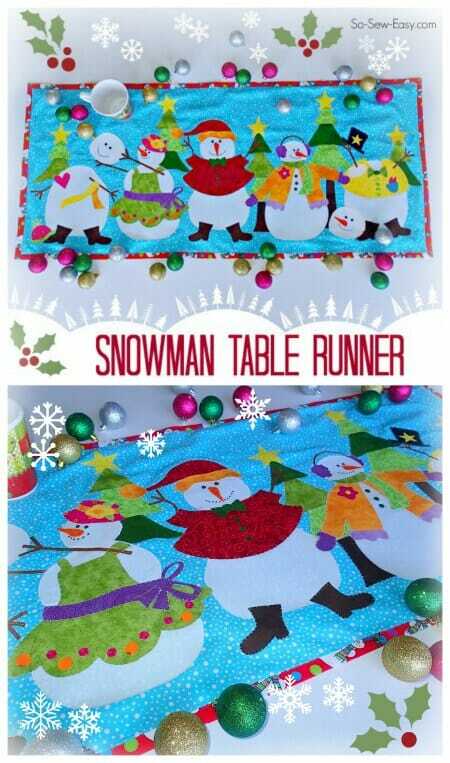 The panel is actually taken from a very popular quilt kit that the instructor offers in her own store, but the class materials also includes the templates and pattern for you to be able to make this Snowman Table Runner, panel or wall hanging yourself using your own fabrics. This is such a gorgeous pattern that I think it's worth taking the class just to get a chance to sew this project. But I also already sewed one of the other projects – do you remember the Oliver the Owl nursery pillow I made? The Owl applique is another of the class projects and you get the template for this one too, as well as a pretty butterfly quilt as you go project that I haven't tried yet. 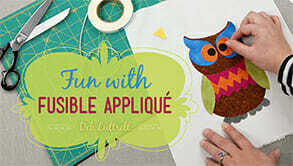 You can read my full review of the Fun with Fusible Applique class here – I also got you a special So Sew Easy discount of 33% off the class if this is something you would like to try your hand at. Anyway, I've been rambling on and on and not even showed you what I made. I decided because of my sorry lack of choice at my local fabric shop that it worked better for me to buy the ready made kit. This way, I could make sure I had the right fabrics for the job without having to ‘make do' with colors or patterns that weren't quite right. Here's what the kit looks like. You can actually see on the back where the paper has been singed by the laser! But the fabric remains untouched and just perfectly cut – with no effort on my part – win! All of the pieces come ready backed with Heat N Bond Lite so you simply snip them off the sheets, peel off the paper and fuse them in place in seconds with your iron. Easy! 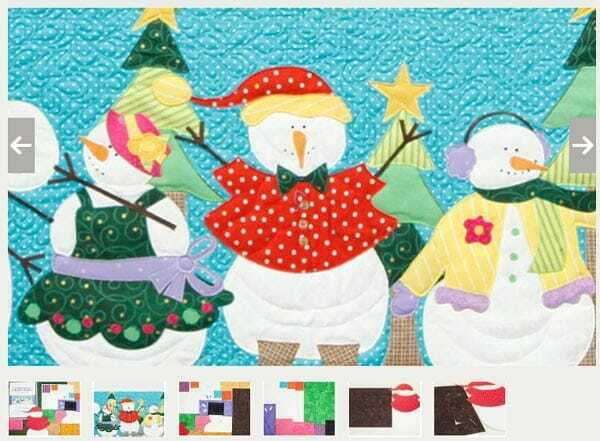 But if you didn't buy the kit, you simply use the templates provided for the snowmen, trees etc like normal applique patterns, trace them onto the Heat N Bond, fuse to your fabric and cut out the shapes. It's a quick and easy process and a great way to use up your fabric scraps on this sort of project. As part of the class, the instructor shows us a tip on how to lay out a large or complicated design by tracing it onto a clear vinyl first. That really helped me to lay everything out properly and accurately before fusing it into place and finding I'd missed a bit or got some pieces muddled up. Here it is all laid out. First I fused a Sulky Iron-On Stabilizer to the back of my background fabric, then I fused just small areas at a time of the applique pieces, using the individual templates and the complete overlay. 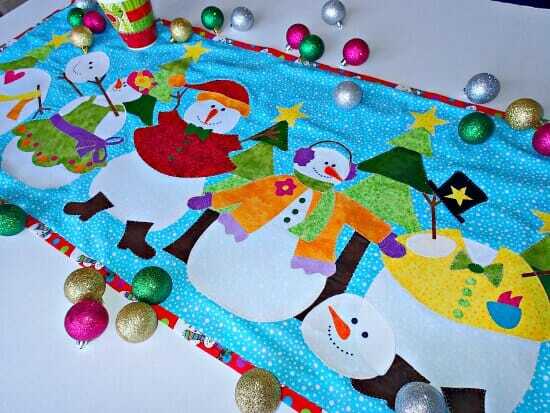 I added a simple red snowman fabric backing and folded it over the front edge to finish. I had ironed it – honestly! But it looks a bit wrinkled because I used the flash on my camera. I'm actually really delighted with it. 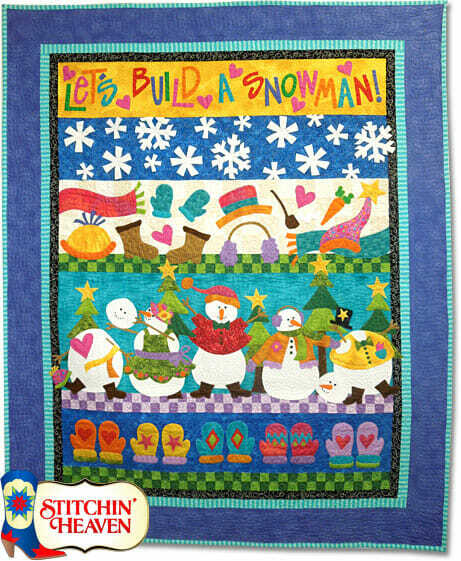 You can buy the full Snowman Applique Kit on Craftsy here. Or simply use the templates that come with the class to make up your own snowmen. I enrolled in the class – but sad to say no more kits are available. I hope they’ll get them back in stock soon – but if not your class materials includes the full templates so you can cut your own kit from your own fabric stash. Yes, but I am so busy that having them already laser cut is the difference between finishing and not…. so I’m keeping my fingers crossed that more kits come out soon! I already have this class but so far have not have the time to really get into it. I also looked for the kit but they were all gone. 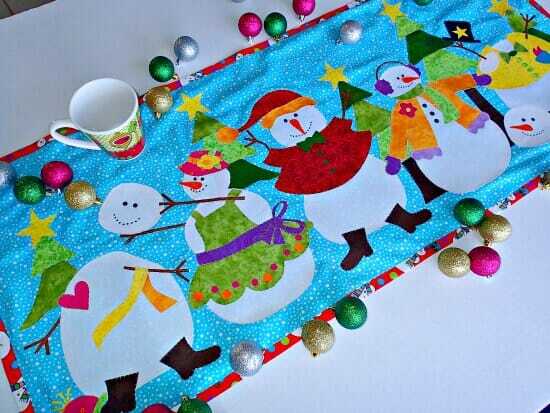 The table runner is adorable and I’ll either buy the kit when it is offered again or make my own. This is a must have! 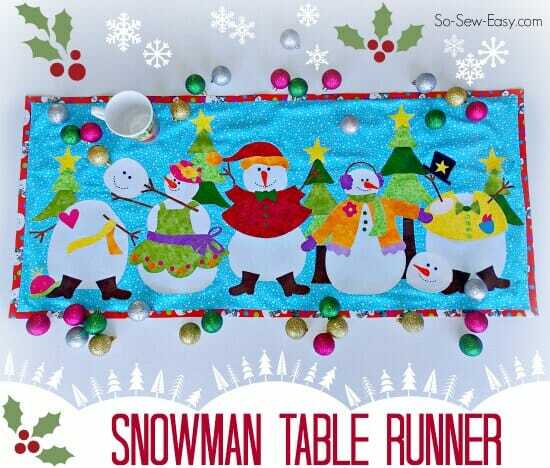 Fun post and the table runner is adorable. Craftsy is out of stock but I did join the “if” list – if more become available. I’m hopeing it wil be back in stock soon.